What a lovely surprise from Sherri from Inside Out Design. I'm honored that she included my office in her post on wallpaper. I'm still in love with it as much as the day I chose it. I love working in here every day! Be sure to pop on over and say hello. You can also see some of the other beautiful papers fellow designers and bloggers are using in their projects. All so pretty! For those who are interested, my paper is Farrow & Ball, Wisteria. 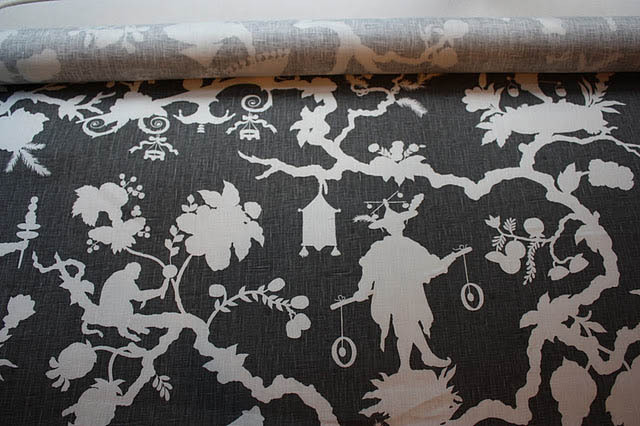 And, another huge thank you goes out to Nancy from Marucs Design for including my Schumacher Shantung Silhouette fabric in her post 'Current Fabric & Wallpaper Obsessions'. This fabric has been at my workroom for over a month and cannot wait to get the call to come pick up. If you recall when I first showed it, it's for my new roman shade in my kitchen. Cannot wait! Thank you again, Sherri and Nancy! I am honored!